How to keep your house clean with pets? What a popular question! Of course you love your furry family members! Is it possible cleaning house carpet with pets? It can be rather difficult to have dogs and cats and keep your house clean and healthy. Don’t worry about it! There are a few simple steps to manage everything. All you need to do is learn a few tricks, put in some regular effort, and stick to the routine. Read the article carefully and at the end you’ll see the way out. Fur: It’s not difficult to brush your cat or dog every day. Typically animals love this and it helps you bond with your pet, a win-win! You’ll be surprised at how helpful it is! Spending five minutes brushing your pet will cut down on the hair that floats around your home. Daily brushing also gets rid of dead skin and you’ll notice that your pet looks and smells better after. So, you probably need to buy a brush if you don’t have it yet! Specific Odors: Put a fabric softener sheet in your favorite scent under the sofa or chair cushions where your pet likes to hang out. Dirt: Cleaning house carpet with pets is impossible without placing mats at both the outside and inside of every door. Why? It will cut down the dirt that their paws track inside the house. Make sure these mats are washable so you can throw them in the wash as needed. It would be also useful to coat surfaces in dark paint. Obviously, the best thing you can do for your kitchen is to paint all your lower cabinets in Gloss Black! Dark paint does an excellent job of hiding smears from wet noses and mud from wagging tails. It is easy to wipe down. You can take the paint to cabinets and walls in other areas of the house, too. Emergency clean-up kit: To avoid messes getting out of hand, keep the following must-haves handy: a bucket with spray stain removers, rags, paper towels, and disposable disinfectant wipes. It often happens that you have no time for professional cleaning right now, so, the clean-up kit is needed for cleaning house carpet with pets! Regular vacuuming: Pets will always shed, so it is important to vacuum often. 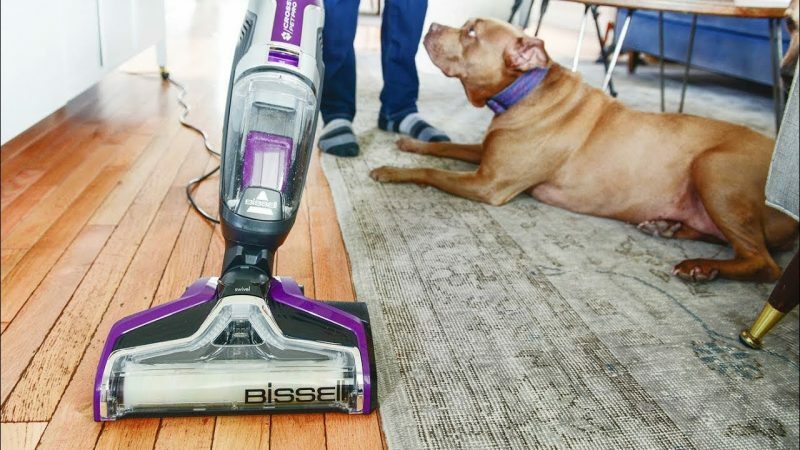 If it’s just you and one pet, you can get away with vacuuming once or twice a week. But, for every other person and pet you should add another vacuum to the routine. If you have a big family and more than one pet, it is recommended to vacuum your carpet every day. Don’t worry! It doesn’t take much time! To save time you can also swiffer wood surfaces and minimize time that your pets spend in carpeted rooms. Professional carpet and rug cleaning: Between routine cleanings it’s important to give your carpets a deep clean. Can you do it on your own? Don’t think so! You are not going to take professional cleaning equipment for rent, aren’t you? Pet dander, hair, mites, etc. in bed deeply into the fibers of your rugs and carpets. If you are prone to allergies, it’s even more important to invest in a carpet cleaning at least once or twice a year. Just call for the cleaning company and spend a couple of hours for walking with your pets while professional cleaners are cleaning your house carefully. Odors: Baking soda is natural ingredient that gets rid of pet odors without any toxic concerns. Sprinkle on carpets, couches, pet beds, etc. Let sit for a couple of hours and vacuum up. You’ll notice the difference of your fresh smelling home. You can also make a baking soda and water spray and mist the air or fabrics easily. Spraying vinegar into the air is another way to beat pet odors. Of course, it doesn’t sound professionally. This method is good to use regularly but professional cleaning is recommended. Cleaning products you need for your floor: Always clean up pet messes right away, and when choosing a cleaner, make sure to use those that are non-toxic for animals. Pets are very sensitive! So, you need a cleaner that stores only safe formulas for pets, but you can also make your own cleaners from baking soda and vinegar that are safe. You can find the recipes of a few DIY cleaners in the web. They are non-toxic for cats and dogs. Remember to never use ammonia to clean, as it’s is similar to the scent of animal urine, which can send mixed signals to your pet. Removing stains: It is impossible to have pets without stains! A big part of cleaning house carpets with pets goes for removing stains. If your pet has accidentally made a mess on your floor, there are a few important things to keep in mind. Have you ever tried adding some shaving cream to your cleaning kit? You could spend a ton trying out every last “miracle” pet stain product, but shaving cream works best, even on the toughest stains such as dog vomit and cat pee. Make sure to use foam, not gel! Simply spray the stain, let it sit and foam for a minute, and then wipe with warm water. You have dogs and cats. You also have carpet. Sometimes these two things don’t go together very well, especially when messy dogs stain your carpet. There are many tips to follow. But if you want to start, remember this: CLEAN PETS=CLEAN CARPETS. This is where to start. Bathing your dogs regularly can keep that dog smell out of your carpets. Keeping up with brushing avoids clumps of hair all over the house as well. All the rest leave for professionals! These prevention tips and cleaning tactics should make your home feel as clean as it was before you added your furry family members.